The smallest of all swans (only 900-1150mm in length, compared to ~1800mm for Trumpeter Swans), the relationship between the Coscoroba Swan and other swan species has been the subject of debate; it is classed in a separate genera (Coscoroba) rather than as Cygnus, and molecular analysis has positioned it as a sister species to the Cape Barren Goose. Nonetheless its overall appearance, particularly the long neck and white plumage, results in it still being grouped with the swans, albeit unlike the other white swans it has black tips to the primaries. 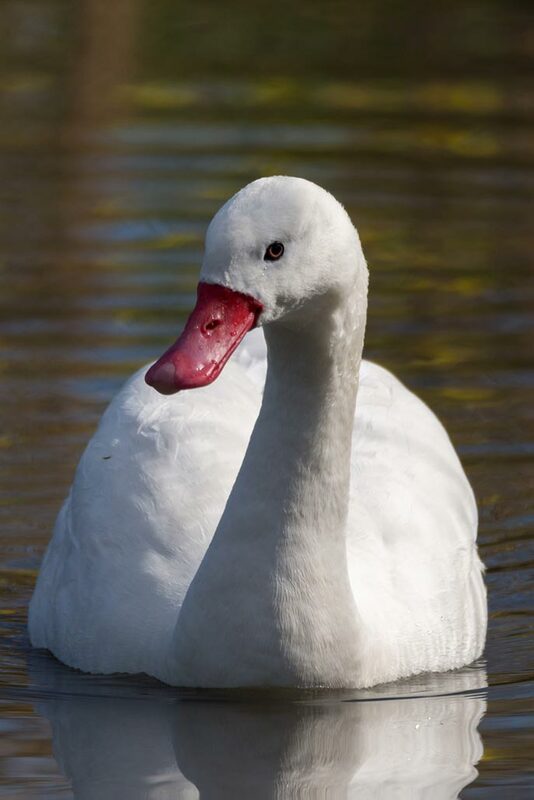 The adult Coscoroba Swan’s short neck with a rounded head-shape, featuring feathers that extend well beyond the eyes to cover the face, is similar to whistling duck head and neck shape and facial plumage. The swans have short broad wings compared to northern migratory swans, and a short rounded tail (Delacour 1954–64). Their bright red bill, spatulate and upturned in shape and without a basal knob, is diagnostic. The cygnets are mainly grey-white but have dark patterning on the crown, back and wings, unlike all other swan species. The juvenile grey bill that becomes red by 5 months, although remains duller than in adult birds. 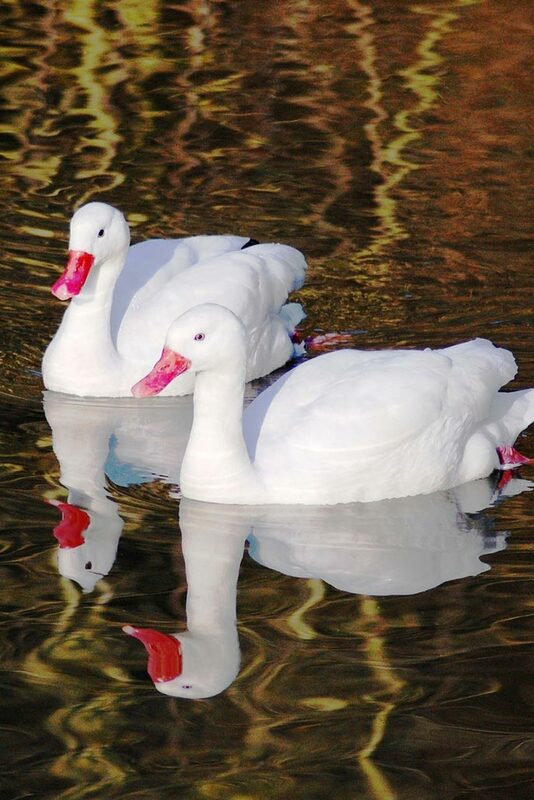 White adult plumage is developed by 8 months, with the exception of some flecks of grey feathers on the top of the head. Sexual maturity is reached at around 3 years. Unlike other swan species, notes are noticeably higher in males than in females. The idiosyncratic cos-cor-oo call, which gave the bird its name, is usually given when threatening intruders. Single hooting notes are used between paired birds, often with the male sounding first. 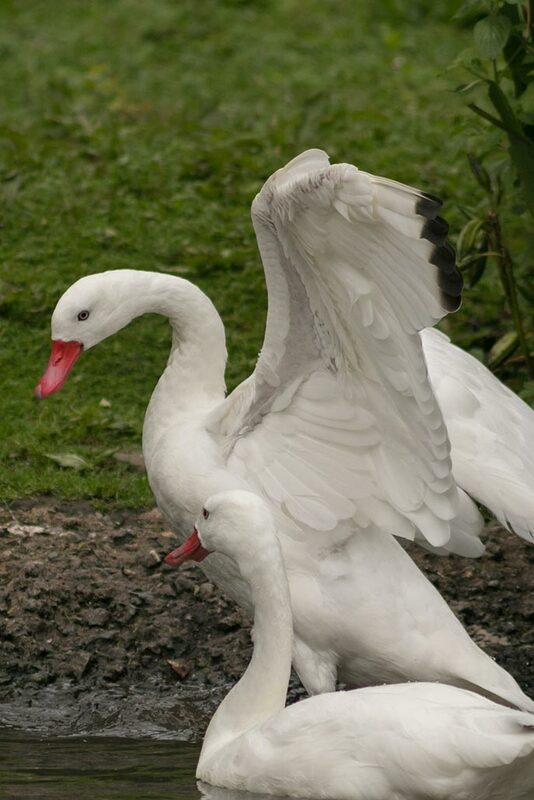 Immatures give loud chirping calls and trills approached by parents, and give loud aggressive chirping calls when approached by other aggressive swans. 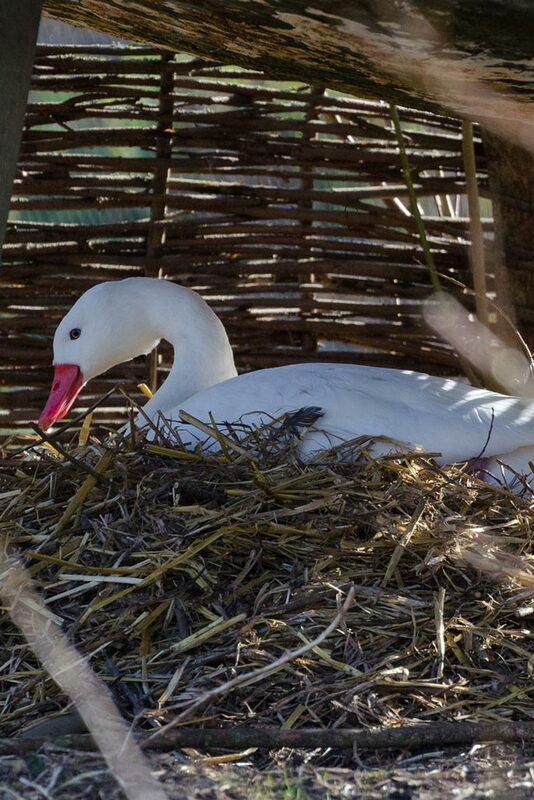 The moult patterns of wild Coscorobas are unknown but, based on captive individuals, they are assumed to have one moult of body and wing feathers annually. Captive adults in the northern hemisphere have been observed moulting flight feathers in late July-August, whereas in south Brazil this is known to happen in August-November (Nascimento et al. 2001), and further south in southern Chile moulting has been reported in last April (review in Kear 2005). 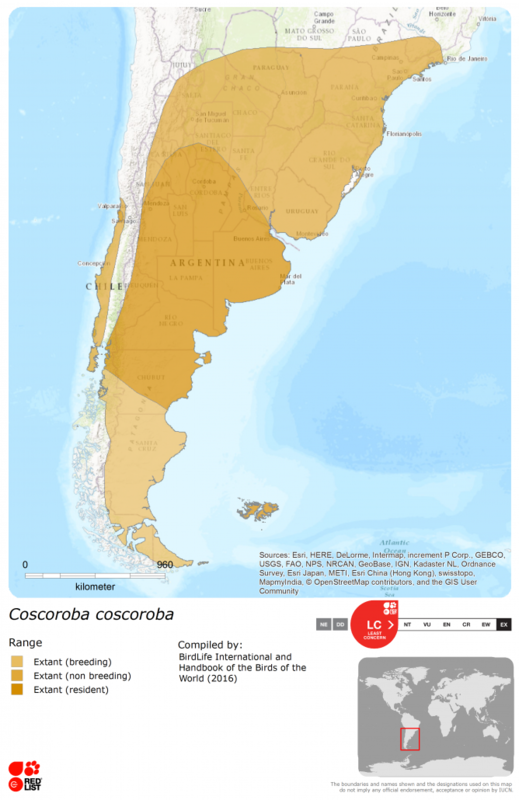 The Coscoroba Swan is native to South America, seeming to prefer lowland and coastal areas, but may be found at lakes and pools up to 1000 m. Its range overlaps that of the Black-necked Swan, but with a slightly more southerly and patchy distribution, ranging from Tierra del Fuego and the Falkland Islands in the south, north through Chile, Argentina and Paraguay to Southern Brazil (Scott 1972). Breeding occurs mainly in southern parts of Argentina and Chile. Little is known of the migratory routes, but it is thought that birds in the southern part of the range are mainly migratory whereas more northerly birds are sedentary. Redistribution also occurs in line with climatic conditions, with the movement of birds from Argentina into Uruguay in 1988/89 attributed to drought (Vaz-Ferreira & Rilla 1991; Kear 2005). From: (1) Wetlands International 2018 (Unpublished information supplied by P. Canevari from the Neotropical Wetlands Program in 1993 and by Wetlands International Specialist Groups in 2006). Wetland areas including shallow lagoons, freshwater marshes and lakes with abundant vegetation (Fjeldså & Krabbe 1990). Permanent freshwater lakes > 8 ha in size are considered important for C. coscoroba both during and outside of the breeding season. Does not upend as often as other swans, because the fine serrations lining the broad bill are adapted for straining particles from the water surface. Therefore feeds mainly on aquatic vegetation and invertebrates whilst dabbling or wading in shallow waters, and also comes ashore to graze on adjacent pasture. Little evidence of extensive historical exploitation, and apparently not highly sought after by hunters. The swans’ patchy distribution however makes it vulnerable to habitat loss and local extinctions, particularly since the biology underlying distribution is poorly understood. The consequences for the species of drought conditions during several years in the past two decades is unclear. Although the species not thought to be in decline, extensive internationally-coordinated counts are required to assess distribution and population levels, and to determine factors influencing site selection (Kear 2005). Delacour, J. (1954–64). The Waterfowl of the World. Country Life, London, U.K..
Fjeldså, J. and Krabbe, N. (1990). Birds of the High Andes. Zoological Museum, University of Copenhagen and Apollo Books, Svendborg, Denmark. Kear, J. (2005). Ducks, Geese and Swans. Volume 1. Oxford University Press, Oxford, U.K.
Nascimento, J.L.X., Flores, J.M., Ataguile, B.S., Koch, M., Scherer, S.B. & Santos, P.J.P. (2001). 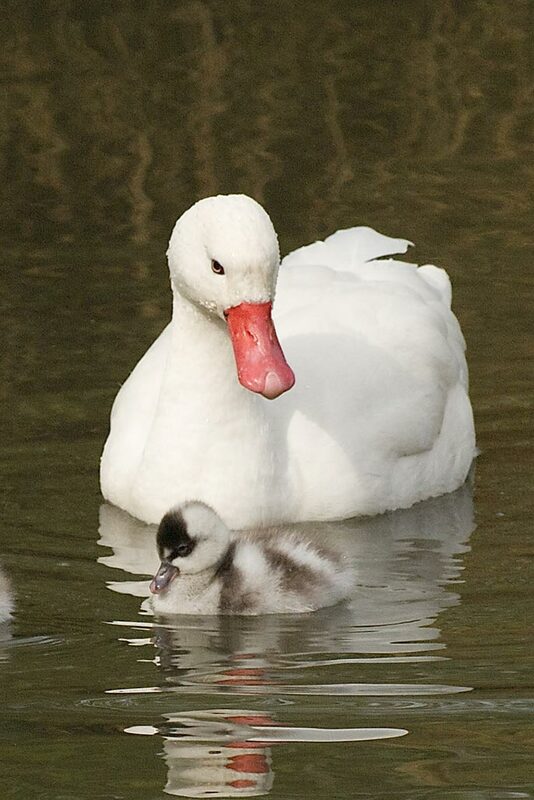 Biological aspects of the Black-necked Swan (Cygnus melancoryphus) and Coscoroba Swan (Coscoroba coscoroba) in Rio Grande do Sul state, Brazil. Melopsittacus 4: 31–38. Scott, P. & The Wildfowl Trust (1972). The Swans. Michael Joseph, London, U.K..
Vaz-Ferreira, R. & Rilla, F. (1991). Black-necked Swan Cygnus melancoryphus and Coscoroba Swan Coscoroba coscoroba in a wetland in Uruguay. Wildfowl (Special Supplement 1): 272–77. Wetlands International (2018). Waterbird Population Estimates. Accessible at http://wpe.wetlands.org/ [Accessed Feb 2018].